Ourscreen: Create your own private cinema screenings | What Hi-Fi? Ourscreen allows you to create your own private cinema screenings, deciding on the location, the film, the time – and who's invited. 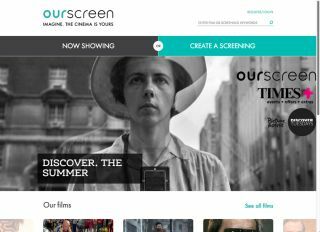 The Ourscreen project is currently supported by cinemas in 13 cities around the UK: Bath, Brighton, Cambridge, Edinburgh, Exeter, Henley, Liverpool, London, Norwich, Oxford, Southampton, Stratford-upon-Avon and York. In most cases, the cinemas are part of the Picturehouse chain. With the service, you're able to select which film you want to watch, which day you want to watch it on and what time you want to watch it. Some films have specific dates you can choose from, others let you choose any day of the week. You then decide if you want a private screening for you and your friends, or to make it available to the public. All Ourscreen asks is that all tickets get sold in a certain time period for the showing to go ahead - much like the Kickstarter model. The film library currently has around 200 films, but it has access to another 20,000 plus films that can be organised upon request. The catalogue comprises recent releases such as The Grand Budapest Hotel and classics such as Casablanca and Breakfast at Tiffany's. Best of all, Ourscreen will even let you show your own film provided it's BBFC certified. Pricing depends on the time of day you select and the film you choose. Each film's distributor sets a price and Ourscreen takes a percentage as well. But Ourscreen says you shouldn't expect to pay any more than your local multiplex. The company has said it will be adding more independent cinemas over time before targeting bigger chains. Users are able to request new films and locations too. Head over to the Ourscreen website to find out more and get involved.